I found this book in a pile of books in my house. 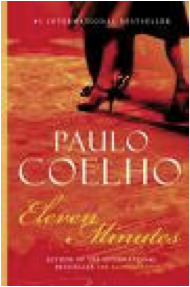 This book is the first book that I have read from Paulo Coleho, and I was deeply engrossed by his writing. His writing touched me because it felt so real and deep. His words sometimes folt in the air so that readers can understand the meaning by their own terms. This book is about a prostitute, who was blinded by love from money and adverture. Love is like water or air. Without love, one cannot continue with his life. Materials can bring one happiness but only for temporary. Love, on the other hand, seems to give one a deep happiness, hope, and life. Not only the book provides the importance of love, but also provides some information about prostitution. People generally have negative impressions on prostitute; however when they read this book, their perspective will change. It surely did, in my case. Paulo Cohelo writes book as if he were writing a poem. I think, it is impossible to have one to not be touched by his writing. The main character seems to be real, because she has ambitions, hope, apathy, but becomes warm after her tough and painful experiences. I think that people who are not even interested in reading books will be drawn into this book once they start reading it. This is definitely the book that can illuminate, enlighten you about love and its importance.